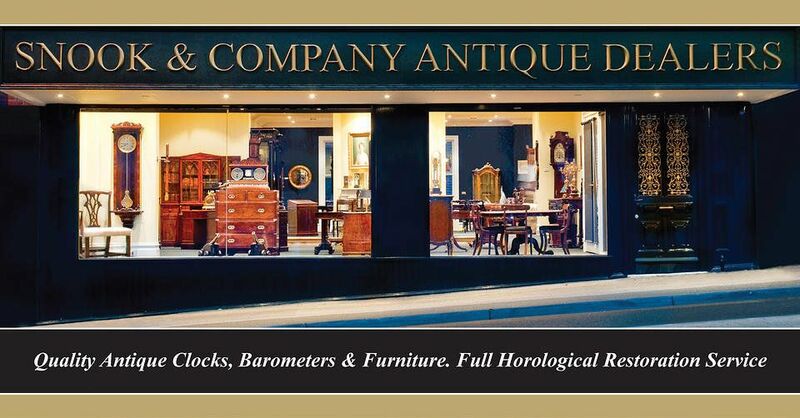 Snook & Company Antique Dealers are amongst the premier antique dealers situated in Melbourne, Victoria, AUSTRALIA. We are one of the most visited antique dealerships when customers from around Australia and overseas visit antique stores in Melbourne. Our shop and workshops in the suburb of Camberwell are a must to visit when trying to track down that special antique or collectable or enquiring about repairs to clocks, barometers and antique furniture. So when searching antiques in Melbourne visit Snook & Company. Our Camberwell showroom houses a wide selection of fully restored clocks, barometers and music boxes. Along with selected 18th & 19th century furniture to suit every room in the home along with a selection of decorative items to match. We also stock a varied collection of smaller antique collectable items ideal for gifts or that special corporate presentation gift. We also operate a well-equipped horological workshop specialising in clock, barometer and music box repair. Please view or restoration page for details and informative video. Our website represents just a small part of our current stock so please feel free to contact us if you do not see exactly the item you are looking for as we may well have that item in our warehouse or workshop awaiting restoration. Snook & Company are always happy to have the opportunity to purchase so if you have antiques for sale of the type we sell, please contact us and save on those auction commissions. Snook & Company are proud members of The Australian Antique Dealers Association, and the international body CINOA and abide by their code of practice and ethics and guarantee all goods sold as described. For all you queries,please fill in the form below.